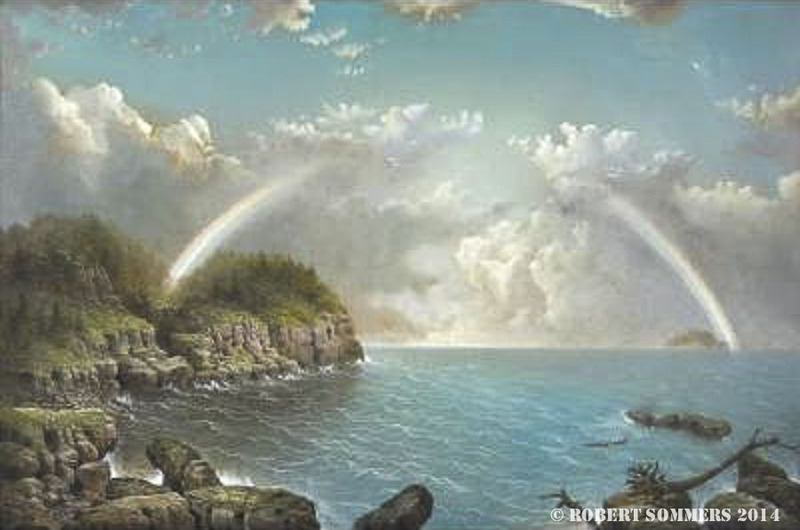 George Douglas Brewerton (1827-1901) Rocky coast with rainbow pastel 24 x 36″ I believe that it is in a quite unusual original frame, original glass. Incredibly finely drawn. Signed on a rock in the foreground. p.o.r. Note: this is a horrible photograph. I will reshoot it at my earliest opportunity. Born in Newport, Rhode Island, George Brewerton was a sketch artist, journalist, pastor, author, and army officer. As an early sketch artist, he was in California in 1847 and 1848 during the Mexican/American War. However, he became best known as a painter of western landscapes in oil and pastel. He was born in Newport, Rhode Island and raised throughout the Northeast as the family followed his father who was a Brigadier General and who from 1845 to 1852, was superintendent of the U.S. Military Academy at West Point. During this time, young Brewerton studied with Robert Weir, who was then the drawing master at West Point. He also trained for a military career at West Point, and in 1846 sailed to California as a volunteer with the army when war with Mexico was imminent. They arrived in San Francisco Bay during March/April, 1847. Shortly after he went to Vera Cruz, Mexico. In 1848, he was ordered to Los Angeles, where he met Kit Carson, and the two left for Independence, Missouri traveling overland through Arizona and New Mexico where Brewerton became ill and had to stay behind while Carson completed the trip. Subsequent assignments for Brewerton included Fort McIntosh, near Laredo, Texas and Ringgold Barracks near Rio Grande City. In 1852, Brewerton resigned from the army and returned to journalism, becoming a special correspondent for the The New York Times. His accounts of his trip with Carson appeared there and in Harper’s Monthly and the New York Herald. In 1853, Brewerton wrote an article about his experiences on this stay in Taos published in Harper’s magazine. Brewerton was a Yankee Protestant, and his attitudes reflected the anti-Mexican attitudes prevalent after the Mexican War. He wrote of Taos: “its inhabitants exhibit all the indolent, lounging characteristics of the lower order of Mexicans, the utter want both of moral and mental culture” (Samuels 65). In 1854, he went to Kansas to report on events that subsequently led to the Civil War and read law in the office of a lawyer and was admitted to the Kansas Bar. Shortly after he moved to New York and exhibited his views and paintings at the National Academy of Design. His exhibited works indicate he traveled and painted widely from California to the Tropics including the Adirondack, Catskill, and White mountains and along the New England coast to Maine and the Bay of Fundy as well as to Ireland. By 1858, he was helping his father fortify forts in South Carolina. During the Civil War, manuals illustrated and written by Brewerton were used widely for the instruction of recruits, and he served on the staff of a militia unit. During 1866-67, he was pastor of a Baptist Church in Annville, Pennsylvania, and then he settled in Brooklyn where he wrote books and poetry and illustrated books including History of Washington by Julian Hawthorne. He spent much time in Newport painting marines and landscapes and continued to travel in the New Mexico, Arizona, and California. He died in Fordham, New York in 1901.